1.Add Walls to the Floor Plan pane. 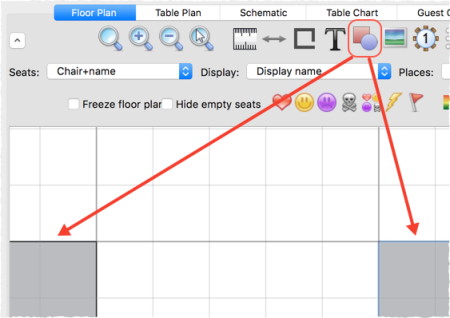 1.Click the Dimensions icon at the top of the Floor Plan pane. 2.Set Size across and down to the maximum dimensions of the room and click OK.
3.Click the Insert shape icon at the top of the Floor Plan pane. 4.Create a shape equal to the same size as an unusable area of the room, set it to the same colour as the outside of the floor plan and click OK.
5.Drag the shape to the appropriate position. 6.Repeat 3, 4 and 5 as necessary. 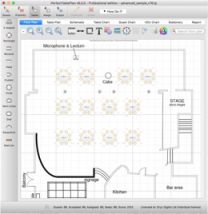 If you have a scale image of the venue you can use it as the background to the floor plan.